Experience the RV Lifestyle with us! It’s RV Showtime again in York, Pennsylvania! Whatever your family camping budget is, the York RV Show will have your dream RV. Join Pennsylvania’s largest tow-able RV dealer, Lerch RV, at the upcoming show for great sale prices. Whatever your interest or budget, we will have plenty of tow-able travel trailers and fifth wheels on display. From entry-level Summerland travel trailers, family value minded Springdales, to the full luxury of camping the Open Range 3X with three-inch thick side walls. Find us in Memorial Hall East Building B. The 2016 York RV Campers World Show offers a great RV show experience. Resorts, campgrounds, and RV lifestyle accessories surround the RV displays with vacation destination ideas plus fun. During the show you will find bingo games for free weekends of camping, camper games, instant door prizes, camping package prizes and strolling clowns to entertain children of all ages. Lerch RV will have the it’s annual large display of over twenty travel trailer and 5th wheel RVs for your browsing enjoyment. Offering show only deals and pricing. Do no miss the chance to take advantage of pre-season pricing on great brands like Summerland, Springdale, Sprinter, Open Range 3X, Light, Roamer, Open Range Ultra Lite, Fuzion, Impact, Impact Vapor Lite, and much more. Great RV deals, the newest floor plan offerings, great campgrounds, and great food make the York RV Show a must to attend. I personally can not wait to have some famous Bricker’s French Fries. Get $1.00 off your entry admission. This is must go to show for RV Enthusiasts! Lerch RV, Pennsylvania’s largest tow-able RV dealership, will have travel trailers, fifth wheels and a large parts/accessories area on display….all at show special prices! This show is the “go-to place” to begin planning your camping vacations for the coming season, trading up to your dream RV, seeing the new 2016 RVs, or just learning about the joys of travel in a recreational vehicle! Visit our display for low pre-camping season pricing. We will be offering show only pricing, you can not even get these low prices on our lot. So come visit us at the 2016 Harrisburg Pennsylvania RV Show. New RVers or those old hands at traveling the RV high road will discover this is the ideal show to learn about new RV products, campgrounds, travel destinations and the RV lifestyle at the Harrisburg Pennsylvania RV Show and Sale. We will have Pennsylvania’s top-selling RVs on display by Passport, Highland Ridge, Outback, Shasta Flyte and many more to look at. The Hershey Show, officially known as America’s Largest RV Show by the sponsoring Pennsylvania RV & Camping Association (PRVCA), has become the kickoff venue for the RV industry to unveil its new model year lines on a national scale to both a trade and consumer audience. And this year’s event – set for Sept 16-20 at the Giant Center in Hershey, Pa. – should go a long way toward reinforcing that reputation. America’s Largest RV Show has been featured on cable TV Shows on several different channels. The show has become a destination for many consumers and industry experts. Where else can a camping or RV enthusiast find everything they desire to see. From lightweight tow behind folding tent trailers to high-end luxury motor coaches. Once again this year, Lerch RV will be representing one of the fastest growing brands in the industry today, Highland Ridge RV. The new home to all Open Range RV products, this year’s Highland Ridge RV display will boast sixteen travel trailers and fifth wheel RVs. The display area is wide open, easily navigable by families with strollers. New this year, Lerch RV will also be representing the Springdale and Summerland brands built by Keystone RV. This traditional ‘stick and tin’ built travel trailers represent a fantastic price for those budget minded camping families. All without sacrificing features that campers have come to enjoy and expect in their new RVs. We invite you to join us September 16-20, at the Giant Center in Hershey, Pennsylvania. 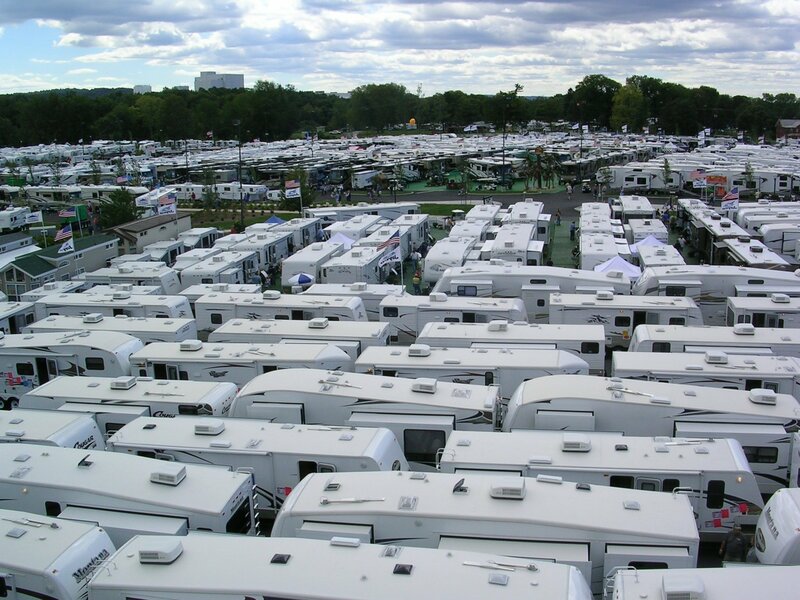 And take in the wonderful spectacle that is America’s Largest RV Show. 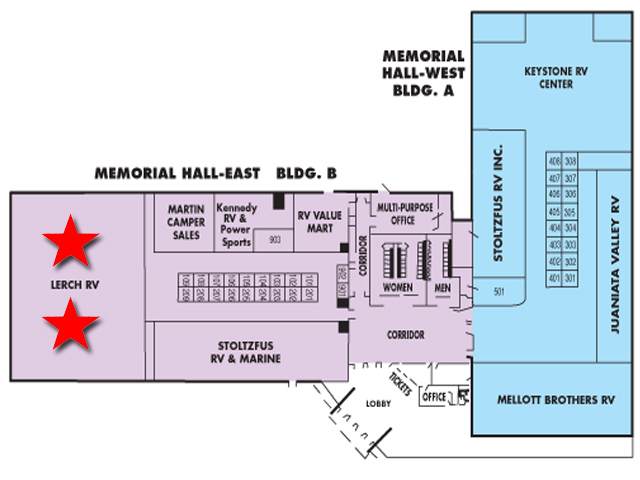 The 2015 York RV Campers World Show is at a later time this year. This means you have less of a time to wait till Spring camping season to begin after your purchase. Resorts, campgrounds, and RV lifestyle accessories surround the RV displays with vacation destination ideas plus fun. During the show you will find bingo games for free weekends of camping, camper games, instant door prizes, camping package prizes and strolling clowns to entertain children of all ages. Lerch RV will have the it’s annual large display of over 20+ travel trailer and 5th wheel RVs for your browsing enjoyment. Offering show only deals and pricing. Do no miss the chance to take advantage of pre-season pricing on great brands like Summerland, Springdale, Sprinter, Open Range 3X, Light, Roamer, Journeyer, Fuzion, Impact, and much more. Great RV deals, the newest floor plan offerings, great campgrounds, and great food make the York RV Show a must to attend. I can not wait to have some famous Bricker’s French Fries. Save a few buck$ with this coupon. This is the must go to show for every RV enthusiast. Lerch RV will have many RVS on display at the Harrisburg RV Show. We will also have large parts and RV accessory area for picking up those great buys. All at show special prices! This show is the “go to place” to begin planning your upcoming camping vacations. Or maybe you are trading up to your dream RV. We are looking for quality pre-owned travel trailers and fifth wheels. Visit our display for low pre-season sale pricing. We will be offering show only pricing, you cannot even get these low prices on our lot. So come visit our RV display at the Harrisburg Pennsylvania RV Show. New RVers or those old hands at traveling the RV road will discover this the ideal show to learn about new RV products, campgrounds, and parts. We will have national top-selling RVs by Passport, Open Range Light, and Outback. Just to name a few. So come visit us at the Harrisburg Pennsylvania RV Show at the Farm Show Complex in Harrisburg, PA.
Join Lerch RV and SAVE $$$ at the Pennsylvania Adventure RV Expo. February 27 – March 2 at the Blair County Convention Center, Altoona PA. Join us for a weekend of special savings and camping fun. It is time to think about the upcoming camping season. The Hershey Show, officially known as America’s Largest RV Show by the sponsoring Pennsylvania RV & Camping Association (PRVCA), has become the kickoff venue for the RV industry to unveil its new model year lines on a national scale to both a trade and consumer audience. And this year’s event – set for Sept 9-15 at the Giant Center in Hershey, Pa. – should go a long way toward reinforcing that reputation. • Through the end of July, the Hershey Show’s sold space totaled 817,120 net square feet versus 745,127 net square feet in 2012. • The show’s total square footage as of mid-July: 1.54 million gross square feet. • Outdoor manufacturer space is up 18% for this year’s show and the number of displays has increased by about 50 booths. That said, PRVCA won’t be attempting to return the show’s square footage to its all-time, pre-recessionary high because the association has decided not to try to expand beyond the eastside foot bridge to the adjacent Giant Center parking lots, a configuration that just didn’t seem to work for everybody. “I don’t know if we’ll ever get over that (modern high point) as long as the show committee agrees with me that we shouldn’t go across the road again,” said Saltzgiver. We are PA’s Largest Sprinter and Open Range RV Dealership. We have been helping families make camping memories for over 40 years. 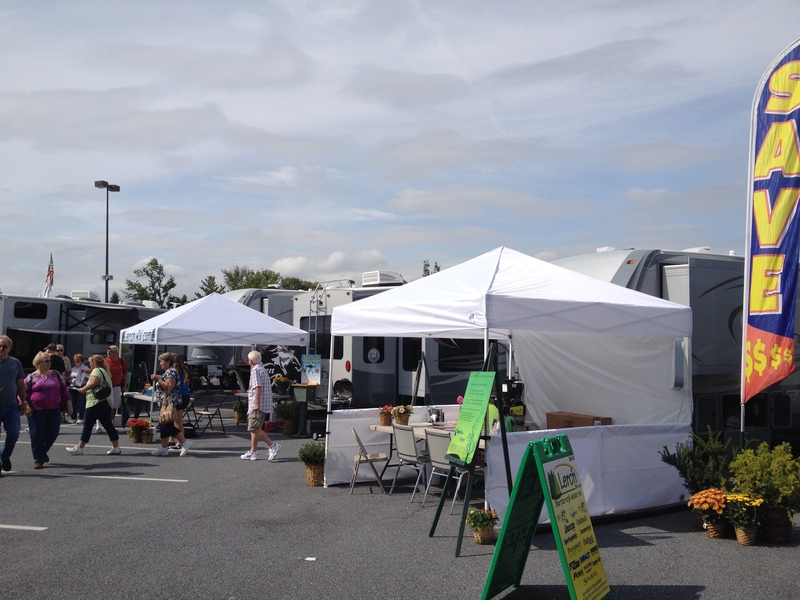 Over those years we have grown to become one of the premiere RV dealerships in the Mid-Atlantic area. So come visit our Milroy, PA location and see what we have to offer. Our high volume purchasing, low overhead allows us to offer low show prices everyday on a large selection of new RVs by Keystone RV Company, Cruiser RV, Highland Ridge RV, and KZ RV. Check out our extensive line up of new inventory of travel trailers and fifth wheels including Sprinter, Sprinter Campfire, Open Range, Passport, Passport SL Series, Outback Super Lite, Outback Ultra Lite, Springdale, Sportsmen, Connect, Connect Lite, Escape, Escape Mini, Durango, Durango Half Ton, Open Range Ultra Lite, Fun Finder, and Shadow Cruiser. Also toy hauler campers from Stryker, Highlander, and Sportster. If you are looking for a pre-owned RV. Lerch RV has what you are looking for. From Pop-Up campers through Travel Trailers, from 15′ trailers to 42′ Fifth Wheels, check out our inventory of used campers. Our low pressure, knowledgeable sales team will gladly help you choose the RV that will suit your needs. You will enjoy our open lot policy with our sales pressure. Remember that you are never charged for dealer prep of your new RV. Financing is available through our Finance Department, with terms and rates that will work for you. When is the best time to buy a new RV? Sprinter 347FWLFT – an outstanding fiver.